We Were Crowned Gym 4 Life Champions 2014 !!! Our team of gymnasts travelled to Byron Bay on the weekend for the Gym 4 Life Challenge. After receiving a GOLD award for our display we were crowned the AUSTRALIAN CHAMPIONS at the Gala performance of Aladin. Together our acrobats can do anything even build amazing pyramids. Some of the gymnasts from Gosford Gymnastics will be heading off shortly to Byron Bay to perform in the 2014 Gym 4 Life Challenge. Rehearsals and costumes are under way and we are all looking forward to a fun weekend of gymnastics. We run adults classes each Monday & Wednesday evening from 7.30 to 9.30pm. Qualified Coaches who teach you in a fun, energetic class. 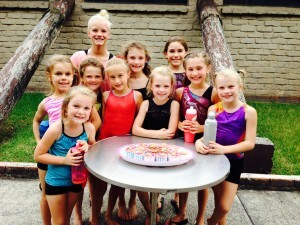 Another successful year for the Central Coast Cup hosted by Gosford Gymnastics. We had over 250 competitors over the 2 days of competition! This was a qualifier for State Stream gymnasts and everyone has qualified to attend State Championships in a few weeks time. Congrats to everyone. Happy Birthday Molly – Molly brought some yummy cupcakes to celebrate her birthday with her class mates. Here are our Acrobats in their Balance Leotards ready for their competition today. Good Luck Girls we know you will be great.